So much of the current political climate in the United States seems to be born of a dissatisfaction with the current state of affairs, and a desire for change. One of voters’ top concerns in the 2016 presidential election was the economy. Despite numbers showing the economy has been improving, many Americans weren’t feeling those improvements. Look at that skew! The top 1% of Americans possess over 40% of the wealth. The bottom 80% of Americans—that’s almost 256 million people—own just 7% of the nation’s wealth. These numbers might surprise you, but unfortunately, much of the discussion about this issue has focused on the middle and left-hand sides of this chart. Americans have a sense that there should be more money available to them, but think it’s either being taken from them or never making it into their pocketbooks. They are led to believe that the problem is “freeloaders” at the bottom, or immigrants taking all the jobs in the middle. However, even the most cursory look at the chart above leads us to a different conclusion. It seems like much of the money must be going to the right end of the chart. We collectively produce more than enough wealth to feed, house, and provide health care for every American, full stop. Nonetheless, we wind up arguing whether providing health care for the poor or increasing public education funding is necessary. It scarcely crosses our mind to consider if executive compensation in the hundreds of millions of dollars or bonuses of nearly equal magnitude are the things that may not be necessary. 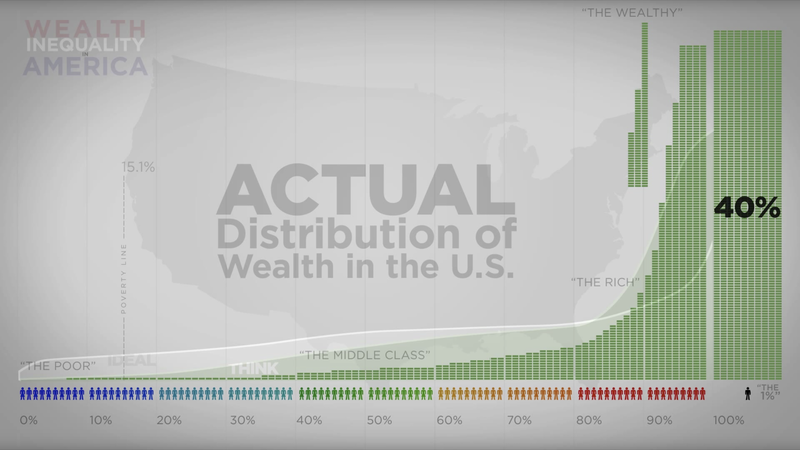 Our current governing and economic systems have made this skewed distribution of wealth possible. This system, which feels so permanent and inevitable, causes individuals to fight over the scarce resources at the bottom instead of considering the big picture. It’s so easy for us to personify our government and systems, and forget that these do not exist apart from the people who participate in them. Systems are created by us and, theoretically, for us. We speak of ‘market forces’ or ‘business decisions’ as though these weren’t simply the collective choices of individuals. Nothing about the current order is inevitable. Just because our system only works for some of us right now, does not mean that we need to accept it and muddle through, or even worse, shovel blame to those who are especially disadvantaged. Instead, it’s possible for us to rethink that system, so that it’s made to benefit all of those who participate in it, and ensure that all are given equal voice. We can work for a better future for everyone through a better system than we have now. But that path forward cannot focus solely on the left of the chart above. We need a path forward that takes into account the full picture, one that is truly democratic, and that each of us can individually and collectively stand behind.